The title says it all. For many people and owners, the debate between the Ferrari 348 and the F355 is one that burns brightly even today. Considering the 348 has not be made since 1995 and the F355 ended production in 1999, we are still having a hard time choosing from two vehicles that haven’t seen the factory floor in 15 years. This article is actually a little self serving as I personally am in the middle of trying to decide which vehicle I want to purchase. So while I have researched both vehicles pretty extensively, I wanted to share my opinion throughout the process. I’m going to cover specs, main differences in model years, and finally maintenance. Both cars are great performers, but they also won’t hold a candle to many modern day sports cars. But in the end, they will both provide plenty of excitement for the average driver. If speed is your only concern, the 355 provides a marginal advantage over the 348. Some have even criticized Ferrari with their 375 bhp measurement for the F355. We’ve seen many comments about the car falling short of that number on a dyno. If you take a 1993 and up 348 and add a better exhaust and headers you are likely to close that performance gap some. The 348 went through several revisions during its run from 1989 through 1995. During the 1991 production year it changed from a double disk clutch, to a single disk, this also reduced the cost to replace it. From 1992 to 1993, 100 special edition 348’s were sold in the United States, dubbed the “Series Speciale”. These cars got a modest bump in hp due to a different exhaust system from previous models and also added color matched lower sills on the body. The Series Speciale also has a unique front splitter and wider rear tires that helped improve stability. In 1993 the 348 Spider debuted at the Los Angles motorshow and the 348 was revised again, both cosmetically and mechanically. Updates included a more efficient exhaust system, new valve springs, upgraded timing belt, revised final drive ratios, and the new Bosch Motronic 2.7 engine management system. Many consider the later year cars to be more reliable, but may older 348’s have received updates and fixes over the years and are on par with newer models for reliability. The Ferrari F355 debuted in 1994 with the GTS and Berlinetta models, with the Spider being released a year later. Originally being outfitted with the same engine management system as the later 348’s, the Bosch Motronic 2.7, in 1996 it was replaced with the newer Bosch Motronic 5.2 management system. Many people say the 2.7 cars have 5-10 more horsepower, but this is often debated and nothing notable that you would feel while driving. In 1997, Ferrari launched the 355F1. This was the first time that a F1 style gearbox had been placed in a vehicle, with computer controlled shifts happening in only 150 milliseconds. The last iteration was the 355 Serie Fiorano. For the last 100 or so units, some claim the number to be the last 104 cars, Ferrari created the ultimate 355 Spider. These included a quicker steering rack, wider track, drilled and ventilated discs, stiffer and lower suspension, upgraded brake pads, and a stiffer anti-roll bar. The Serie Fioranos, because of their limited run and upgrades, command a much higher premium over standard 355’s. If you own or are thinking of owning a Ferrari, you should know that the purchase price is just the first down payment on ownership. Ferrari maintenance isn’t cheap, but most of the maintenance myths floating around the internet are exactly that, myths. Below we have highlighted some of the maintenance costs from our Ferrari Maintenance Costs article. 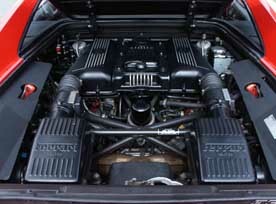 We also have a more in depth article on the costs of maintaining a F355. As you see, the 348 and the 355 are very similar in pricing. The 348 is the more raw and visceral driving experience of the two. While the 355 gives you a more controlled and refined ride courtesy of it’s adjustable suspension and power steering. If you have some mechanical skills, you will be able to turn wrenches on both cars, but more so the 348, which could turn into quite a savings in the long run. So there you have it. A short and sweet comparison between the Ferrari 348 and 355. If you are curious as to my choice, well I don’t have one yet. I’m still torn between the two and it will probably come down to finding the right car at the right time. I’m currently leaning towards the 348. Something about the cheese grater side strakes just gets the best of me.